My latest Youtube-video is concerned with a sensational find I did of a recording of Ravi Shankar, made by Radio Netherlands in 1957. I did this find already in January 2002. It might be nice for viewers of my Youtube-channel who are interested in Indian classical music to learn about this interesting historical recording. For more details, see the ‘more info’-section attached to the Youtube-video . 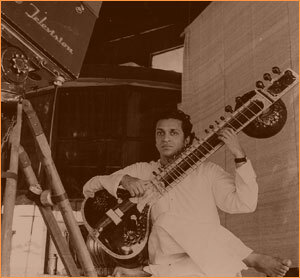 This entry was posted in Gharana / raga music, Peter van Hoboken - dutch pioneer of Indian Classical Music and Dance and tagged 1957, Chatur Lal, India, Netherlands, Nodu Mullick, Peter van Hoboken, Pieter de Rooij, raag, Radio Netherlands, raga, Ravi Shankar, sitar, tabla, Wereldomroep by Pieter de Rooij. Bookmark the permalink.